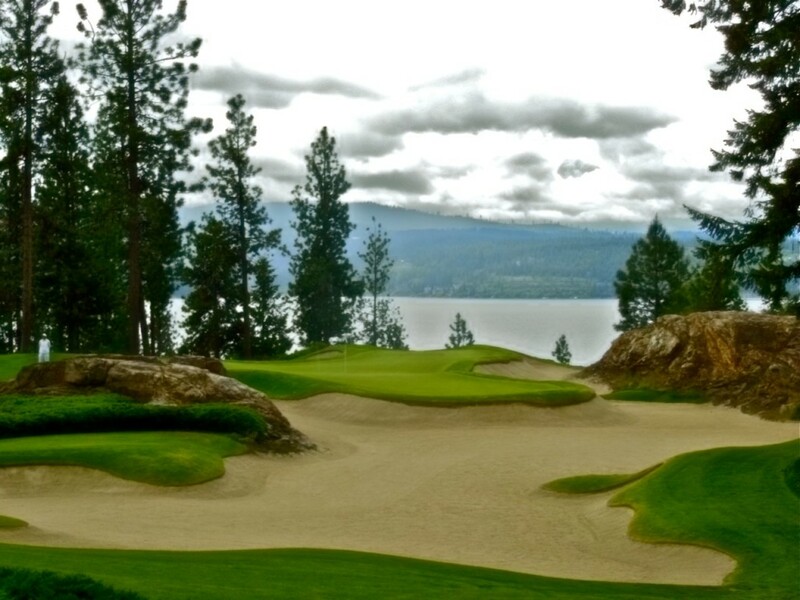 The 5th hole at the Coeur d’Alene Golf & Spa Resort is but a wedge, but par is anything but assured and the view is pretty special too! 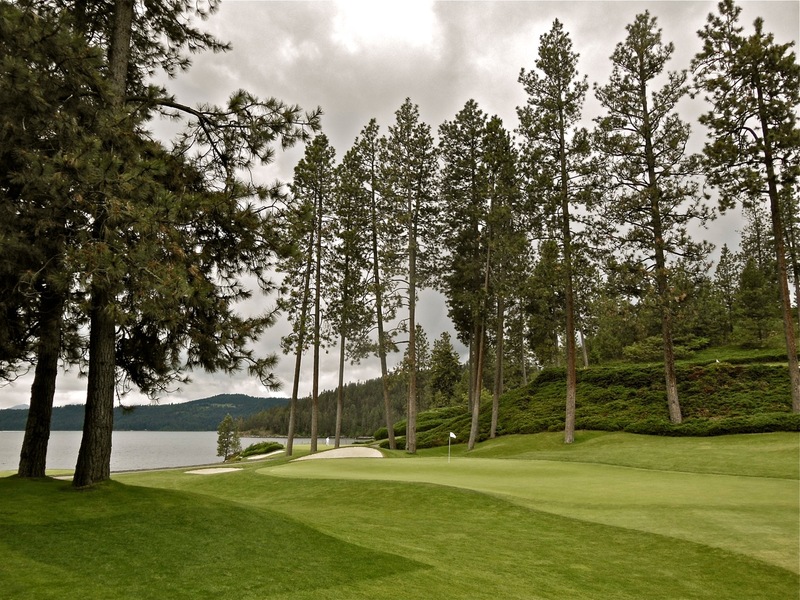 If someone were to ask me what American golf course epitomizes excellence in “resort golf,” I would not hesitate to quickly utter, the Coeur d’Alene Golf & Spa Resort. 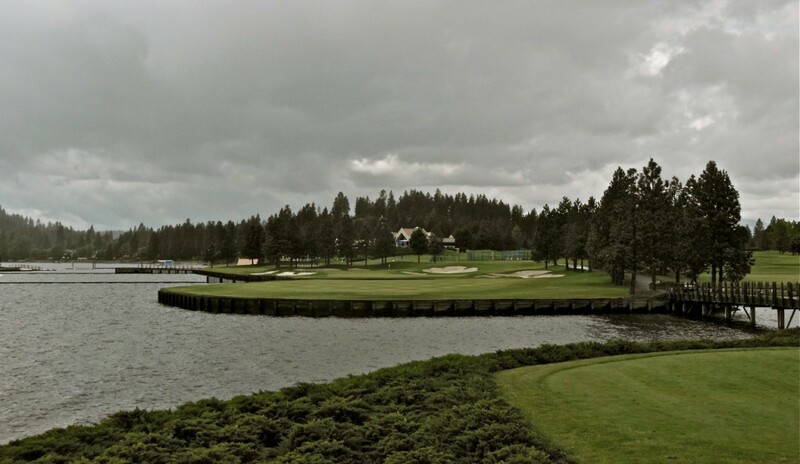 Even on a cloudy, threatening day, the par-four 13th is one spectacular lakeside hole. 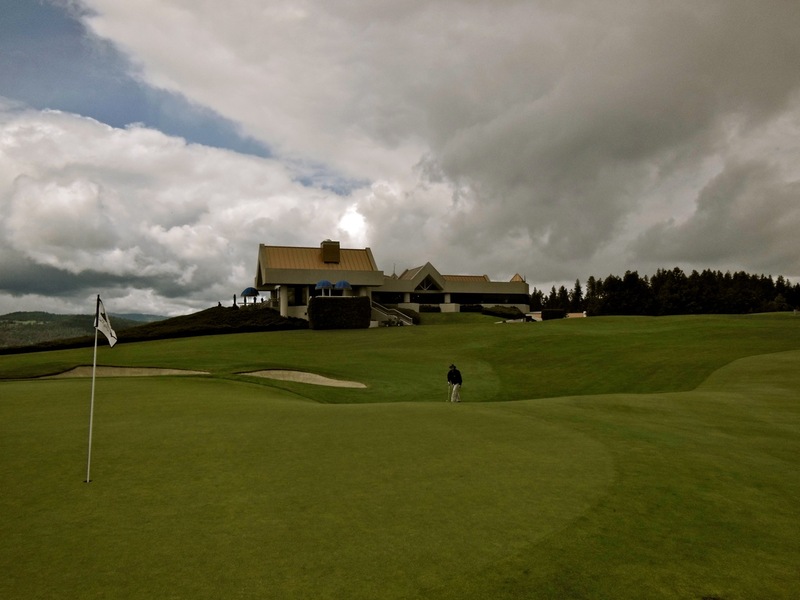 There are tougher courses on oceanfronts, but for my money, this northern Idaho resort facility is the perfect combination of fun, service, first-class merchandising, and a golf course that is spectacular, yet not overbearing. 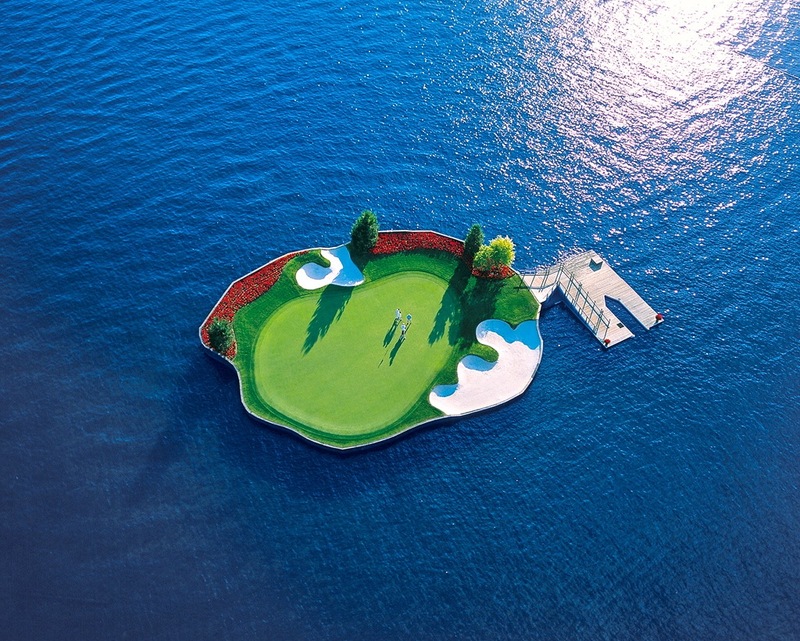 There is easily enough challenge to keep anyone’s attention and it even includes one of the most novel, famous holes in the World – the floating island green. Above is the aerial view of the man-made floating green at the par-three 14th. It is made of concrete and has a basement full of controls underneath it and it can be moved. It’s quite a different view from the tee! 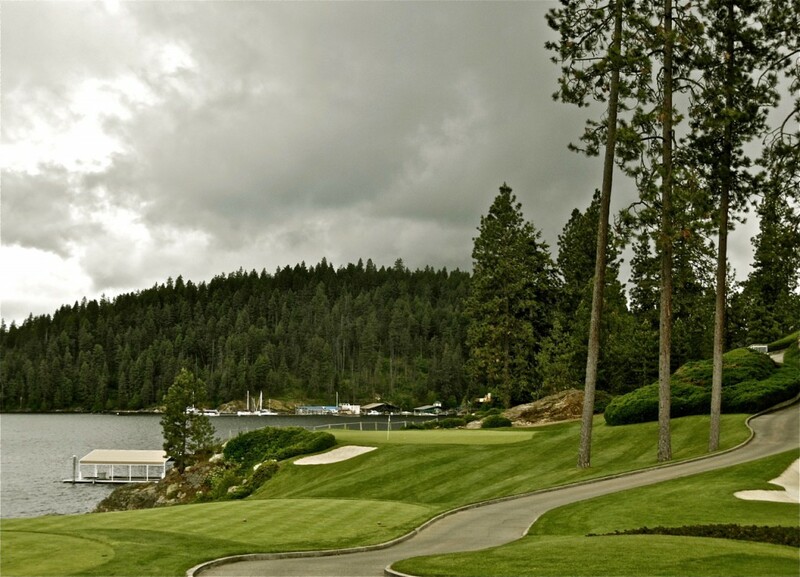 As you pull up to the Coeur d’Alene Golf Resort & Spa lakeside clubhouse your attention is drawn away from the expertly manicured golf grounds to the water, and with it the island green floating in lonely fashion well out into the lake, but you must wait until the 14th hole. Someone who will likely be your forecaddie quickly takes your clubs. Moving into the clubhouse, you can only be impressed with the investment and presentation of inventory as you enter the expansive golf shop. 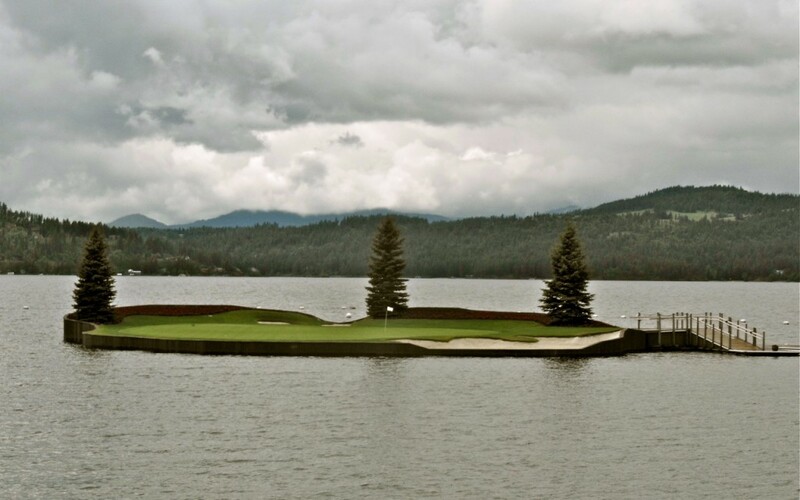 As you warm up, hitting floating range balls into a body of water is hardly new, but how about doing so in such a big scene backdrop as Lake Coeur d’Alene? If the fifth hole was attractive enough, you repeat the view of the lake with the very next hole, a longer drop-shot par-three. The course starts in benign fashion with an easy par-five. In fact, all the par-five are pretty tame. Then as soon as you reach the par-four second, you face what I consider to easily be the most testing two-shotter on the layout. By the third hole, you are lakeside with a little short iron affair with the water hard to your left. In fact, I count the one-shotters as one of the best, and most scenic group of inland par-threes in America. There is a nice range of distances, but everyone will never forget the fourteenth. Typically the distance will range from 95 to 218 so it is a rather daunting shot. Make a par or birdie on this floating green hole and the boat driver who takes you to the green will sign for you a certificate of achievement. That said, the three par-threes on the outgoing nine are as photogenic as Angelina Jolie. Trees that have matured nicely over the years form relatively generous avenues and coupled with artistic bunkering by Scott Miller, and immaculate conditioning make for a wonderful golf adventure. The par-four second is the toughest two-shotter in my opinion. Long, narrow, and often again the breeze off the lake. 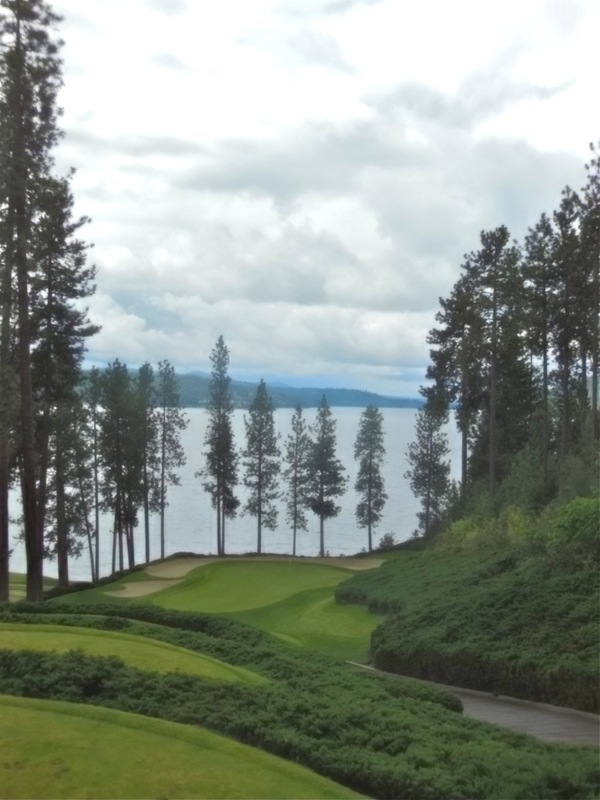 For me, the Coeur d’Alene Golf & Spa Resort epitomizes American resort golf at its best. When you count scenery, service, conditioning, complete merchandising, and fun golf that is not too hard, but far from a pushover, you have a sublime experience. Below is the par-five 9th green with the clubhouse in the background.